Citrus fragrance will fill your garden in spring with the Philadelphus 'Snowbelle' Mockorange. This compact mockorange flowering shrub opens in May to June with citrus scented double white flowers. Plant your 'Snowbelle' Mockorange as a low growing hedge where you can enjoy its wonders. A low maintenance flowering shrub, the Snowbelle Mockorange blooms on previous years growth and should be pruned as needed immediately after flowering. 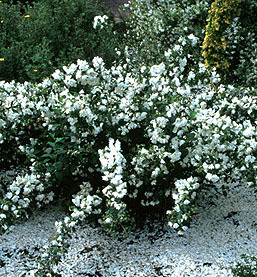 The Snowbelle is an excellent choice for clay soils and is drought tolerant once established. This low compact growing mockorange grows to 3 to 4 feet tall and spreads as wide. It is a show stopper in late spring, but its medium green leaves have limited appeal the rest of the growing season. The Philadelphus 'Snowbelle' Mockorange is excellent for cut flower arrangements when in bloom. Philadelphus 'Snowbelle' Mockorange ships in 3.5 inch pots. Plants shipping to AZ to CA addresses will be bare rooted.